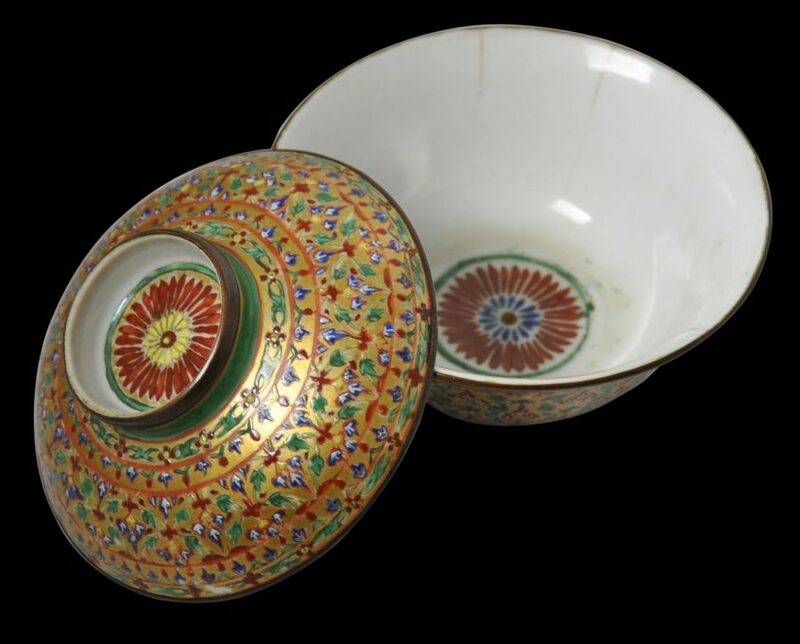 This fine porcelain bowl and cover (cham fa) is decorated in a style known as Lai Nam Thong, which is related to the brightly-coloured Bencharong porcelains that were produced in Jingdezhen in the northeast of China’s Jianxi province, for the Thai market. The identifying characteristic of Lai Nam Thong is its ample use of gold or gilding. 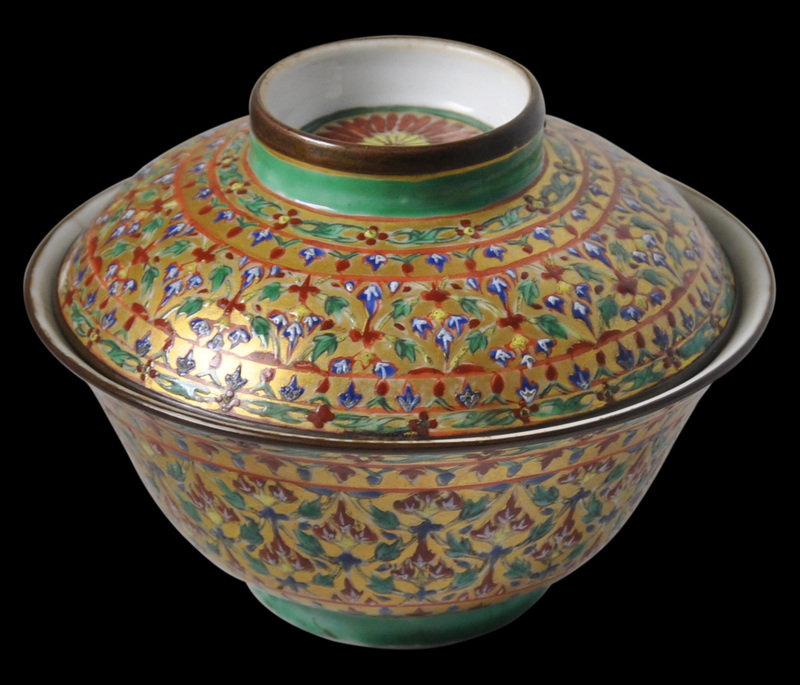 The bowl and cover are decorated all over with a diamond lattice pattern comprising green leaves and in-filled with three red and white tri-lobed petals emerging from a yellow stem, all against a gold background. This is referred to as the rice ball or pumkaobin pattern. 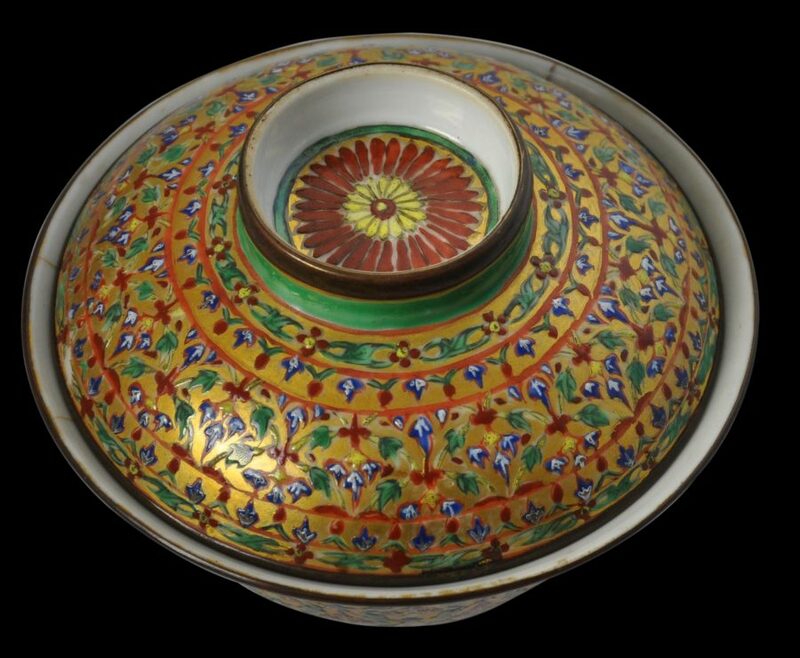 The interior of the bowl and the well of the low pull handle on the top of the lid are both decorated with matching chrysanthemum flower motifs. The rim of the cover pull handle, the cover itself and the top of the bowl are all encased in fine bands of copper to guard against chips. 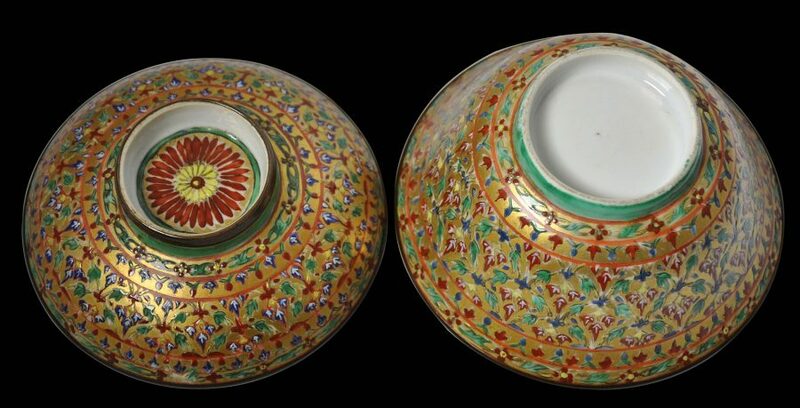 A spittoon in the Wesley Kirkholm collection and illustrated in Rooney (2017, p. 131) has almost identical decoration, as do a series of covered bowls illustrated in Snget al(2011, p. 156), and an example of a covered bowl in Bangkok’s Prasart Museum – see Warren (1990, p. 135). Originally, orders for the Lai Nam Thong and Bencharong porcelain came from the Siamese Court, but with the royal family being unusually polygamous and consequently it having so many offshoots, and with a newly emerging merchant class wanting to emulate the fashions of the royals and minor royals, the demand for the brightly-decorated porcelain spread across the upper and middle echelons of Siamese society. There are no chips to the bowl or cover. There are however three light hairline cracks to the bowl and some minor rubbing to the enamel decoration. Habu, A. & D. Rooney (ed. ),Royal Porcelain from Siam: Unpacking the Ring Collection, Hermes Publishing, 2013. 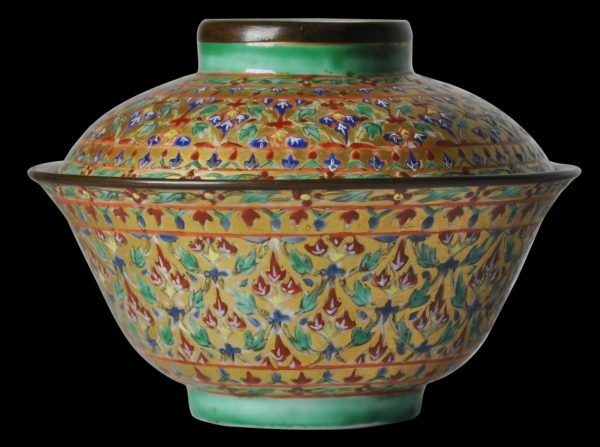 Rooney, D.,Bencharong: Chinese Porcelain for Siam, River Books, 2017. Sng, J., P. Praphai Bisalputra & E. Siu,Bencharong & Chinaware in the Court of Siam: The Surat Osathanugrah Collection, Chawpipope Osathanugrah, 2011. Thammapreechakorn, P., S. Lertrit & K. Pinsri,Ceramic Art in Thailand, Osotspa Co., 1996. Tingley, N.,Doris Duke: The Southeast Asian Art Collection, The Foundation for Southeast Asian Art and Culture, 2003. Warren, W.,The Prasart Museum: Treasures of Thailand, Ibis Books, 1990.